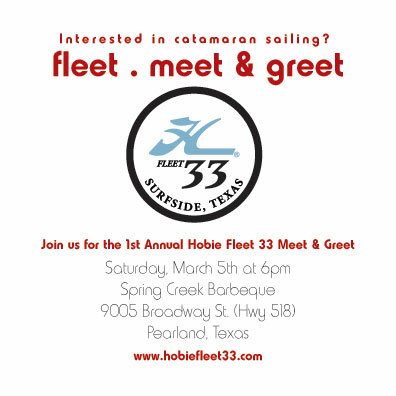 I just want to thank everyone in advance for your efforts and contributions in getting ready for Hobie Fleet 33’s first meet & greet! People have been so supportive I have received emails from HCA members in other states wishing us luck with our new fleet. KO Sailing has put forth a HUGE effort showing us they are a valued member of our sailing community! Everyone keep up the hard work and I will see you all Saturday March 5th 6:00 Spring Creek Barbeque Pearland, TX. ~ by Floyd on February 28, 2011.